Today we are looking at the Gigabyte GA-A55M-S2V, the first A55 motherboard to hit the AnandTech test beds. 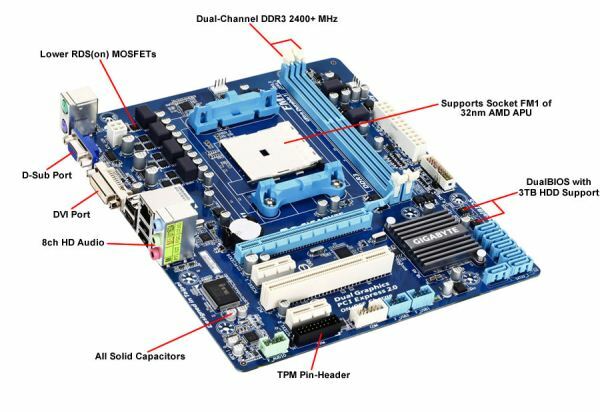 In comparison to the A75 platform which we have covered extensively, although the A55 lacks a few features such as USB 3.0, SATA 6 Gbps and a second full length PCIe slot, the A55 motherboards are usually aimed at low end, low budget system builders. The Gigabyte GA-A55M-S2V comes in at a smaller than mATX form factor for just such occasions. Desktop Llano builders are often looking for a couple of exploitable capabilities – the currently superior iGPU performance that is coupled with the APUs available, and a low but affordable cost. As mentioned previously, the A55 chipset is somewhat reduced, having no USB 3.0 nor any SATA 6 Gbps compared to A75, but this is ultimately not the aim of the chipset. Low budget systems will perhaps not require any USB 3.0 (and to be honest, here in the UK we’re not seeing much of a shift towards USB in the low end consumer space due to production and licensing) nor SATA 6 Gbps (a cheap system would not be paired with an SSD that costs as much as the rest of the system). But the options are there and in our personal opinion, for a motherboard in the sub $75 region, it makes sense. These are not performance systems; they are for family email or basic gaming devices. 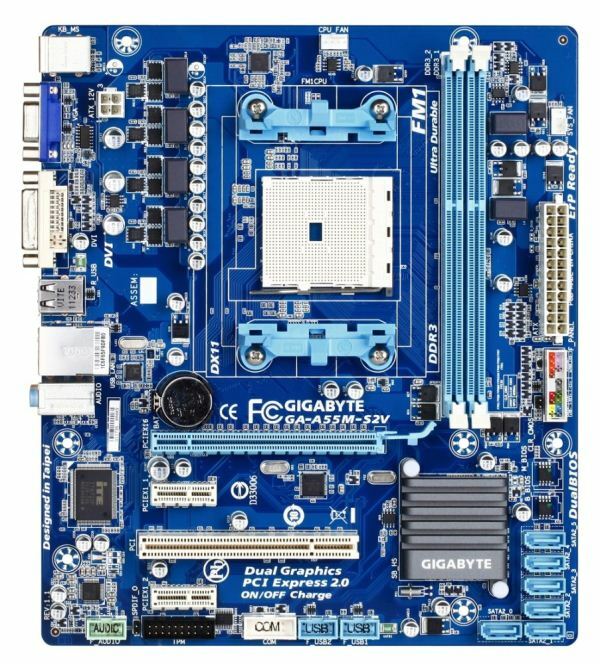 The blue PCB which the GA-A55M-S2V is built on is a typical sighting from the current Gigabyte budget segment. Keen eyes will notice the lack of VRM heatsinks, despite this board being certified to run 100W processors. This will undoubtledly lead to little room in terms of pushing the platform (but that’s not really what A55 is all about). Personally, I would feel more secure with at least something on there. In contrast, there is a heatsink on the FCH to help dissipate chipset heat (~7W) and to provide some extra on-board brand recognition. This is arguably common practice for any motherboard, and it is worth noting that this heatsink does get very warm to the touch when in use. We are treated to two DIMM slots on the board, supporting a dual channel mode and up to 16 GB if appropriate memory modules are used. 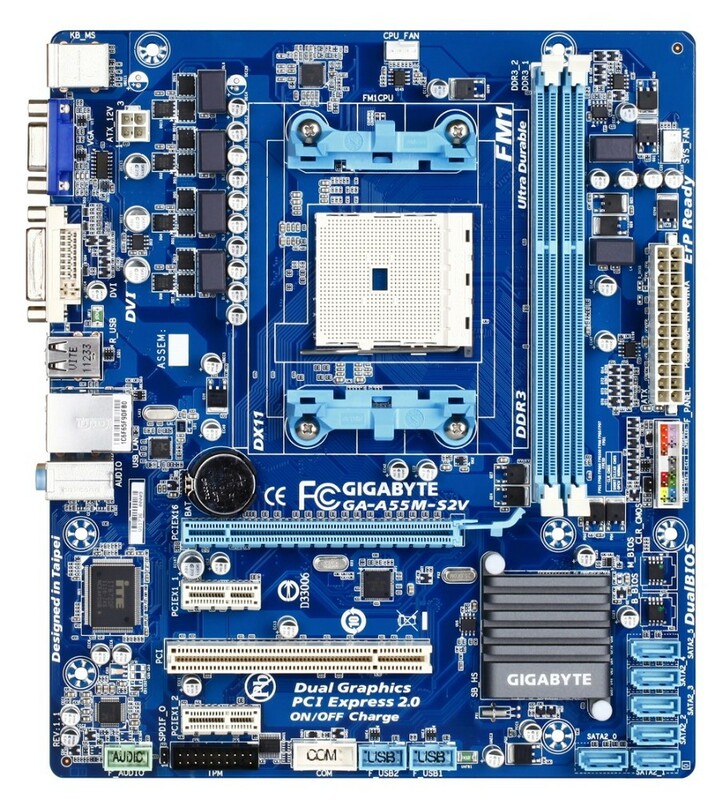 Of note on board is the use of the TPM module in the lower left of the board, which is commonplace on all Gigabyte boards but almost no other manufacturers’ products. This is a feature that Gigabyte implements at little cost and, as I have been told, is listed as a requirement by some of their partners. The inclusion of this is of course to widen the sales potential of the board, however the downside is the extra routing and the PCB real estate it takes up. In terms of fans, we only have two fan connections available on this particular model from Gigabyte – one for the CPU and one for the chassis. It is a little disappointing as there is typically more than a single system fan installed in a case. Both the CPU and the system fans are PWM based. The CPU fan header is located above the socket, but the system fan is in a rather remote location – we find it in the top right hand side of the motherboard. This does not seem like a logical place to put it as most users will require the header on the left to use it for an exhaust fan. There is just one PCIe x16 slot on this board along with two PCIe x1 slots and a single PCI slot. There are two USB 2.0 headers at the bottom of the board to provide expansion for up to four extra USB 2.0 ports in your system should you require them. The six SATA 3 Gbps headers have not been put at a 90 degree angle but there should not be any obstructions from a large graphics card due to their positioning. The direction of the SATA ports though would hinder attempts to remove a locking HDD cable from the top of the set meaning that the four below it would have to be removed. The inputs and outputs of the A55M-S2V are very basic compared to the whole A75 range we have tested. While there are two PS2 ports for legacy mice and keyboards, we have only D-SUB and DVI for video outputs – no HDMI here. There are four USB 2.0 ports, a gigabit LAN port and three audio ports. Yes it is, FM2 is the next socket for desktop Trinity, but I have not ben able to find any information on compatibility between FM1 and2. I thought I read that AMD had one last upgrade for FM1. It was assumed (hoped) they meant Trinity. No power supply manufacturer will optimize its power supplies to have good efficiency below below the 20%, which is what 50-100 watts will be on this 1250w psu. As you can see on techpowerup.com/reviews/OCZ/ZX_1250W/5.html this power supply has 66% efficiency at 65 watts and 75% efficiency at 90 watts. "These are the real world values that consumers may expect from a typical system (minus the monitor) using this motherboard." And who the hell is going to buy a 130$+ video card such a factory overclocked Radeon 5850 when the motherboard is supposed to targeted to value users? Value users are going to either use the integrated video card (why no power consumption values WITHOUT a video card?) which is good enough to watch movies or even play games like World of Warcraft or they're going to get something like a sub 100$ 5750 or a 6750. Yeah, this is standard, as the "anand" testbed and it has to be as similar as possible across all the systems they test from i7 3960X to an E-350. I do not accuse anand of foul play, but it is not really a fit setup for mid to low performance systems. Well, they say it's to make things comparable. But then they have power consumption charts where some systems use different components than others. And they don't put it in the chart. So one system was tested with a Radeon 5870 (low idle) and Windows 7 and another system was tested with a GeForce GTX 285 (~20-30w higher idle) and Windows XP and they don't mark it on the charts. Typically they misrepresent AMD that way. I don't buy it. I understand the concept but I don't buy it. Such a popular website like Anandtech with reasonable income from advertising can very well keep 2-3 power supplies for tests, in order to provide accurate, correct reviews. A 600w power supply is good enough to run benchmarks on virtually ANY processor and single video card combination, even when overclocked. With 2 or more video cards, you can very well change the power supply to a 1000w+ one. Changing power supplies takes minutes on a test bed. Anandtech could also just buy a batch of power supplies from the same series (to have a few as backup in case one or several break) and put them through a load tester, to get the efficiency graph, one similar to the one in the Tech Power Up article I linked. From that point, as they have the efficiency graph, they can just measure the power consumption at the wall and estimate how much the system actually uses. I do not like it either, but remember that Anandtech is not written by people in on physical location. I know some of the contributors are located in different parts of Europe, and I am pretty sure they have some people scattered across the US as well. They cannot ship the same equipment between all these locations and it looks like they have purchased somewhat similar equipment for use in their test. We all know efficiency of a power supply changes when running from 110-120v (us) compared to running from 230v. The 65w idle on 230v in Europe can very well be 70w in US, due to less efficiency when running on US mains power.